Norman G3NVO received his licence in 1959, whilst in the 6th form at school. His interest in radio and electronics became his profession and although he became a highly qualified and professional electronics engineer he never lost his interest in the Amateur Radio. When he was living in the USA he obtained a Licence to operate over there. Norman was a very capable CW operator but was just as happy operating phone and in times gone by built his own equipment. 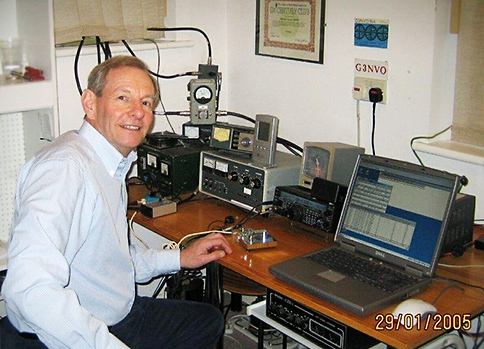 He was especially interested in difficult aspects of the hobby, particularly VHF, where he chased DX on the 2m and 70cm bands and managed to make contacts time and again into North Africa and east out across Europe. He also enjoyed working DX on the HF bands and really enjoyed playing around with antennas. In the late 1980s when we were given access to SIX metres, this became Norm's passion. He managed to make contact with over 197 countries worldwide, as far away as the Antarctic and Australia and, at the time of his death, was listed in 25th place in the world and 4th in the UK. Norm was one of NADARS' mainstays, having been, at times, a committee member, secretary and Chairman for long periods. He was a participant in radio contests both as an individual and as part of a team in club events. He was one of the stalwarts during the annual outings to the Isle of Wight for the IOTA Contest. He was also an instructor on NADARS Foundation and Intermediate Licence courses. He was always willing to demonstrate his station to newcomers and assist fellow amateurs with problems.